Steve Kerrigan has revealed that he quit Bo’ness United due to the shocking nature of their second half collapse in Saturday’s 5-0 humiliation at Tranent, writes Craig Goldthorp. The BUs manager (46) resigned after a year in the hotseat, following his side’s capitulation in the East of Scotland Conference B encounter. Kerrigan opened up to the Journal and admitted: “The main reason I quit was the second half performance. “I never thought we were capable of losing five goals in 90 minutes, never mind in 45. “I felt that it was unacceptable for a club the size of Bo’ness – and with the high expectation levels it has – to do that. “I am the manager responsible for that so I have decided to take the hit. “The frustrating thing is that we dominated the first half. Then I was stunned by what happened in the second. Kerrigan departs Bo’ness with the fourth placed club on 28 points from 14 league games, a mammoth 18 points behind leaders Bonnyrigg Rose and effectively out of any title challenge. 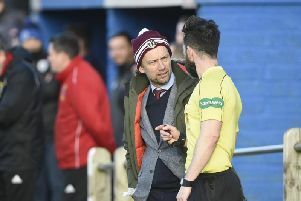 Their up and down form this season has angered a section of the Bo’ness support, with Kerrigan admitting that their barracking reached a crescendo on Saturday. “A section of the Bo’ness support have never really accepted me as manager,” he added. “From my second game in charge, I could hear some of the shouts and some of the stick I was getting from certain sections of the support. “But I have dug deep, tried to be professional and take it forward the best I can. “It is never nice to be criticised but I think most people would say I was doing a good job. Kerrigan’s initial resignation offer on Saturday night was at first declined by BUs’ chairman Iain Muirhead. “The chairman initially asked me to think about my resignation offer for a couple of days,” added Kerrigan, who had previously managed Camelon and Arthurlie before replacing Allan McGonigal as Newtown Park gaffer last January. “I had no sleep on the Saturday night as a few things were bothering me. “I was thinking back to Saturday’s game and also thinking that Bo’ness have had quite a lot of bits of bad luck. “I was fighting with myself, thinking: ‘Do I or don’t I resign’. “The fans’ stick was also getting to me a little bit. “I have always managed to have good relationships with people at my clubs. “And in my time as Bo’ness manager we only lost two games at home. “I know you are never going to please everybody, but on Saturday I heard more abuse from fans than I ever had before. So, after a subsequent discussion with his wife Shirley, Kerrigan decided that quitting was the right thing to do and this was confirmed during a Sunday telephone conversation with Muirhead. Kerrigan, who works as an electrical project manager, plans to take an extended break from football but would like to return to the game in some capacity one day. And he tipped Bo’ness to pick up some good results in the second half of this season. “I think I leave Bo’ness in a wee bit healthier state than when I took over,” he said.